20+ super fun and memorable sibling wedding pictures we've ever come across! Your sibling is your first companion, first best friend and first partner in crime. They will also be the one to be the happiest when you get married (cause they’ll finally get the room to themselves) and also the saddest to watch you go (cause now they don’t have anyone to make fun of!) Cute picture with your sibling(s) at your wedding toh banta hai boss! We shortlisted some of the cutest siblings pictures we’ve ever seen- check them out! 1.Such a fun filled picture! 2. This sister’s pride for her sibling is easily reflected on her face! 3.Sisters always make sure that everything is okay, even your wedding attire! 4. Hoping that he’ll be next in line! 5. Abhay Deol being the perfect brother to his sister Esha Deol! 6. Shopping with the little one for the wedding is the best decision this bride took! 7. Drama toh humara middlename hai! 8. The groom and his brothers look so cool in synchronised jackets and sunglasses! 9. The sisters can’t stop staring at this beautiful bride! 10. These siblings have a royal flair in them! 11.Treating her like the princess she is! 12. Ash Studios’s owner with the owner of her heart! 13. Smear her with the haldi! 14. All ready to drop the haldi bowl on her hair! 17. Laughing it off with the best partner ever! 18. Coming in between lovebirds and not giving them any space. Exactly what a younger sibling does! 19. The family that pops a beer together, stays together! 22.Bride found an innovative to rub some haldi off on her sister! 23. Making up for all the times they fought..aww! 24. 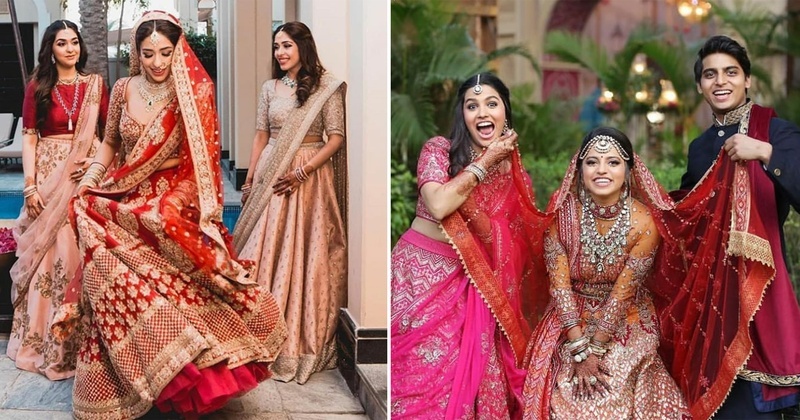 These sisters are careful not to leave lipstick stains on the bride! 25.The bride and her sister got same heels in order to avoid conflicts later! All these pictures have melt us completely (or maybe it’s just the Bombay heat) We are going to give our sibling a hug and then steal the remote from them. Hope we emerge as the winner! Go do the same with yours!